Making plans are good, but with all the information at our disposal we are at risk of getting stuck in analysing situations and not making decisions. In a recent article in Harvard Business Review authors Mankins & Steele suggested that companies focus on making decisions rather than on planning. By heading our planning activities as making decisions it forces us to think in a manner that has many advantages. First, decision making requires us to have a fixed set of alternatives, whereas planning can be more open ended with no destination. Second, decision making forces us to arrive at a course of action while planning can become an end with no decision taken. Planning can also be time fixed like year end plans for the new year, while decisions must be made throughout the year. Running our Real Estate practice cannot be constrained by calendar. The authors suggest that businesses must be issues-focused with the intention to decide on a course of action. Take for instance low sales in the first half of the year. We can approach this predicament with engaging in Sales Planning for the second half of the year. These planning sessions may be quite good, but may not lead us to solve the problem, just analyse the prevailing circumstances. Alternatively, we can come up with a short list of things that can be done to increase sales. A decision-making session can then be labelled ‘Decision Making to Increase Sales”. This forces us to arrive at distinct courses of action to increase sales. 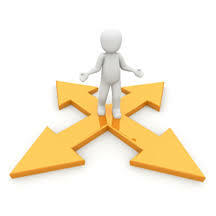 Have a robust set of alternative courses of action from which to make a decision on a particular issue.